Properties of self-organized SiGe quantum dots formed for the first time by ion implantation of Ge ions into Si are studied using Auger electron spectroscopy, atomic-force microscopy, and scanning electron microscopy. It is found that a spatially correlated distribution of Ge atoms is observed in Si layers implanted with Ge ions after subsequent annealing of these layers. As a result, nanometer-sized regions enriched with germanium are formed; germanium concentration in these regions is 10–12% higher than that in the surrounding matrix of the SiGe solid solution. 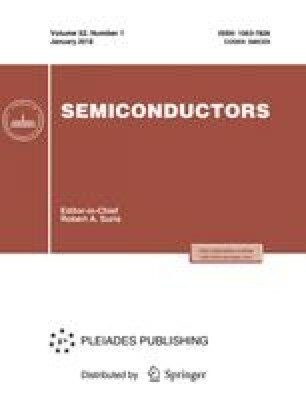 Optical properties of the layers with SiGe quantum dots were studied using Raman scattering and photoluminescence. An intense photoluminescence peak is observed in the wavelength region of 1.54–1.58 µm at room temperature. Translated from Fizika i Tekhnika Poluprovodnikov, Vol. 38, No. 5, 2004, pp. 593–597. Original Russian Text Copyright © 2004 by Parkhomenko, Belogorokhov, Gerasimenko, Irzhak, Lisachenko.